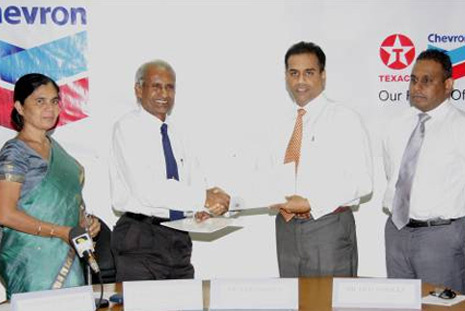 Chevron Sri Lanka renews its commitment as a deaf school sports partner | Welcome to Chevron Lubricant Lanka PLC. January 30, 2008 : Today, Chevron Lubricants Lanka PLC will renew its agreement with the Deaf School Past Pupils’ Association, Ratmalana for a further 3 years as their official sports partner in netball, volleyball and softball cricket. The association between Chevron and the Deaf Schools initially began with the sponsorship of the Deaf Schools Netball Tournament in 2002. With this sponsorship it became increasing apparent for the need to promote sports amongst the differently-abled children to groom them into proficient individuals capable on taking on challenges in the future. Through this agreement chevron will continue to support the Deaf School Past Pupils’ Associations’ annual Netball, Volleyball and softball cricket tournaments where close to 25 deaf schools in the country demonstrate their sporting ability. The President and Committee of the Deaf School Past Pupils’ Association is the dynamic force behind the deaf schools sports activities in the country. Over the years they have worked not only to grow and develop these children but to instil a sense of unity amongst them. With the renewal of this agreement with Chevron, the Association will continue to work towards creating harmony among these schools through sports.